The week before the game Bath were worried about transporting two teams to Spencer in the Intermediate Flags. The club committee deciding that mini bus and cars being the more cost-effective route than a 40-seater coach. 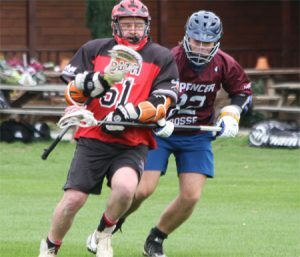 By match day, a combination of injury and “other” commitments meant the club could not muster a full first team, even by promoting up from the seconds, there were some Freshers available, but Captain Luke Wilmot rightly made the call that, with only a couple of hours lacrosse, this game would have been a step too far. Good decision by the committee, would have been a very empty and expensive bus. So, it was that Bath barely managed to put 10 men on the field. In defence, Will Tilson came up from the seconds to keep the pipes, and Wilmot was joined by Laurence Dawson-Smith and Paul Bown (carrying a back injury). In Midfield and Attack (much swapping around to give some breathing space was needed) Mark Lane, released from goal, Josh Yeoman and Alex George were supported by Lloyd Butler, Nik Roberts and Simon Griffiths. 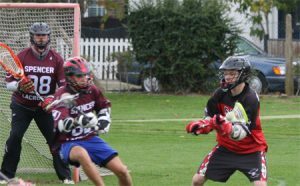 It soon became evident that this was going to be a war of attrition, Spencer had plenty on the bench and aimed to run the visitors off the park. Bath concentrated on trying to play smart, conserving energy. At Face, Yeoman, playing short pole did well, assisted by the wings and coming up with the majority of the ball, occasionally Roberts faced, more to give Yeoman a breather than win the ball. The defensive unit was probably the most solid section of the team, Wilmot had an exceptional game, marshalling the troops, Tilson made some great saves and Bown and D-Smith slid well to frustrate the home team. 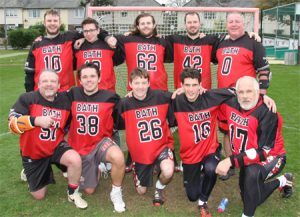 Once in possession Bath looked a threat, causing as much problems for the home keeper, however despite keeping pace for three quarters, and feeling that there might be chance of victory, wear and tear just took its toll. 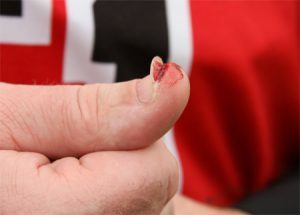 The most spectacular being the loss of a thumb nail by Griffiths. It took Spencer about 10 minutes to get the first goal, which was quickly followed by a second, Bath however dug in, and a good drive by Butler pulled one back. Going in at quarter time only 1 down was a real boost for Bath. The next two quarters were competitive and even, Bath had chances, Lane feeding Roberts on the crease several times. Butler and Yeoman having shots. 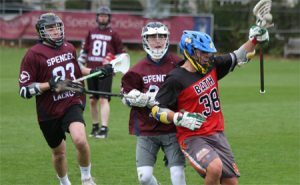 One shot from a front left drive from Yeoman bagged a goal in the second quarter and a wayward feed from Lane in the third drifted into the Spencer net to give Bath a third. Now it was three quarter time, Bath looked beat up and tired. The fourth quarter saw the fresher team win out, Spencer, converted three shots, could have been five but for Tilson and a great knock down by Wilmot. And the Bath Midfield just ran out of steam. The 10 men of Bath should be proud of themselves, a couple of substitutes and the game might have been different. The story may well be different the next time these two teams meet. Bath now drop into the minor Flags, a competition Bath have never won. MVP Alex George, who ran and ran and ran…..
Wilmot – “This feels like that 300 movie” – Roberts – “They all died, didn’t they”?